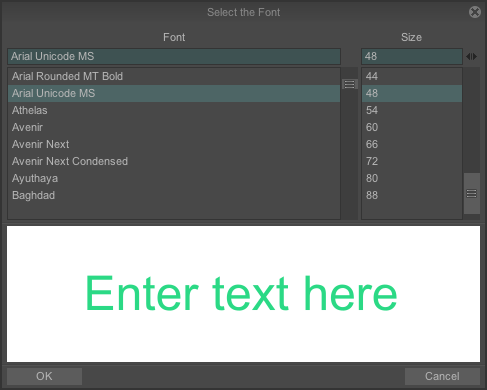 The Text tool is used (shortcut [T]), as its name implies, to generate text brushes. * Enter the text of your choice in the text field at the top of the panel. - That button "▼" gives you an access to the last sentences and words that you wrote in the text field. - The "B" button open a window with a larger text field, in order to work with long sentences. * Direction is used to choose the direction, between horizontal and vertical lecture. * Select Letter mode or Word mode depending upon whether you wish to display the entire content of the text field or simply one letter at a time. All changes to the numeric fields or using the mini-sliders will be taken into account and displayed interactively on the screen for several seconds in order to allow you to view the result of changes and settings made. * The Size variable defines the font size in pixels. * The XScale variable manages the font width. * The Space variable defines the space between characters (a negative value overlaps the characters). * The Italic variable modifies the inclination applied to characters. * The Rotate variable is used to increase or decrease the angle formed between the text and the horizontal axis. * The Track variable adapts the space between characters, but this time, in proportion to the size of each letter in the text field. * The Power variable defines the color quantity applied by the tool. * The Opacity variable defines the text transparency. * The Outline variable creates an outline of varying thickness around the letters, but renders the interior of the letters transparent. * The Smooth variable applies a blur to the letters. * The Border variable creates an outline of varying thickness around the letters. * The Glow variable creates a luminous halo around the letters. 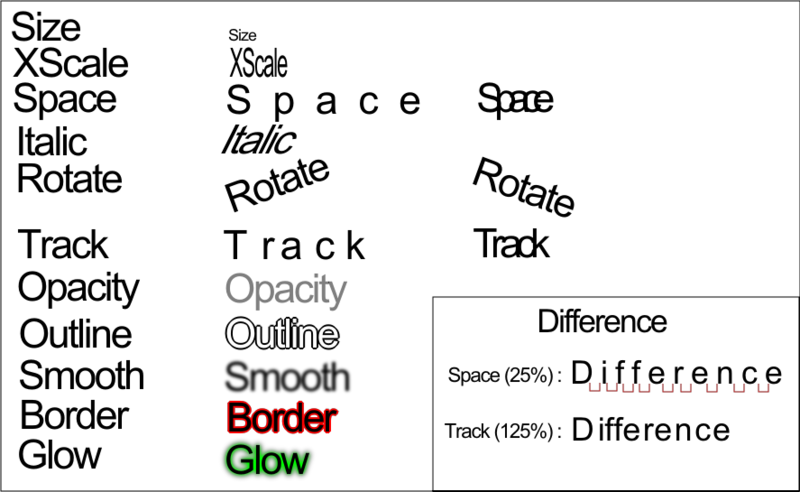 The border and glow may be of any color of your choice. * If the Letter button is selected, an Anim. (Animation) popup menu is present: you may then choose to apply the letters in the text field once only, in a loop, randomly or in ping-pong. * If the Word button is selected, a Step variable is present: this variable works in the same way as for standard drawing tools (see lesson 2). Now you just have to apply your text on your layer, wherever you want, with a simple click on your drawing space. The fonts used by TVPaint Animation are of the ".ttf" (True Type Font) format. * The Reset button resets all settings. * The «▼» button provides access to the last phrases or words entered in the text field. * The B button opens a larger text field in order to work with longer texts. * The number in the bottom left hand corner of the panel represents the text width in number of pixels (a width which is dependent on your settings). * The Create brush button allows you to transform your text into a custom brush and switch to the brush settings in the tool panel. In addition to the settings via the mini-sliders, do not forget to tick the boxes to take these variables into account.